We both had burgers and they were pretty good. With full bellies, we decided it was time to head back “home”. I couldn’t resist getting a picture with my MOV bottle to send back to the store with a tag line about “Big Oil”. How’s that for a hay field?!? We left my dad’s around noon on Monday, July 3rd. According to the GPS, it would take us about 15 hours to reach our destination in Lone Oak, Texas. We were hoping for an uneventful trip, after all, Waldo had a nice new roof and Steve had replaced the surge tank and both thermostats. We thought our overheating problems were behind us. We didn’t even make it out of Florida before Waldo’s engine temp began to climb…ugh! My aunt and granny live about 40 minutes north of the route we were taking, so we spent our first night “on the road” at their house. It should have only taken us about 5 1/2 hours to get there, but, thanks to Waldo’s overheating, it took us nearly 7 hours. My aunt had a wonderful dinner waiting for us, fall off the bone ribs, fried corn bread cakes, peas & beans, roasted potatoes and fresh tomatoes. After stuffing ourselves and catching up a bit, we called it a night. The next morning, breakfast was waiting for us! Bacon, sausage, fresh eggs (she has her own chickens), straight out of the oven biscuits and homemade preserves. Thank you Aunt Frances! My cousin came over to see us before we continued on our way. And he came bearing gifts…probably one of the biggest watermelons I had ever seen. We gathered on the back porch, while he cut it into mouth watering chunks. Between the 5 of us, we managed to eat almost 1/2 of it. Then he cut a huge chunk to take with us. Bonus! I awoke Wednesday morning happy in the knowledge, we would reach our destination by early afternoon. I was excited and ready to be there! It was a little after 1 pm when we pulled into Wind Point Park, our new “home for now”. We were warmly welcomed and shown to site B2, a beautiful shady spot to call home. The park manager and her husband stopped by later that evening and offered us a tour of the park. We climbed onto the back of their golf cart and off we went. What a slice of heaven!! Beautiful scenery, friendly faces and lots of wildlife. So here we are in Florida. After the “adventure” of our trip down here, I was definitely ready for some down time. I knew we had to get Waldo over to the repair shop for an estimate on the roof, but first we had to unload the belongings staying in Florida. I’m sure Waldo was quite happy to shed a few pounds! On Thursday, we brought Waldo to Nature Coast RV, handed over the keys and hoped for the best. It would be a few days before we got the estimate so we set our sights on some relaxation time. A great meal – as always! Before we left New Hampshire, I had been looking for a place to workamp. Work Camping is when you work at a campground in exchange for your RV site. Sometimes there is an opportunity for extra hours for pay, but not always. We had committed to a park in Texas, but didn’t leave NH in time to make it when they needed us. I was very happy when the manager of Wind Point Park in Lone Oak, Texas emailed me and said we were still welcome to come work for the summer! Their website shows a beautiful park and conjures visions of lovely sunsets and quiet evenings by the campfire. I can’t wait to get there and settle into our new life as workampers! They are hoping to have it done by the 30th so we can be on our way. It was still over an hour before high tide, so I’m glad I headed in when I did. Hoping my next post is about an uneventful 14 hour trip to Texas and our arrival at Wind Point Park!!!! If you saw the last post, you know we are already aware of the fact we need a new roof. We had already taken care of a plumbing issue (the cap on the faucet in the kitchen had to be replaced). Steve fixed a starting issue with our generator. SO, when we left, we were pretty confident we were on our way. Not so fast…literally! Not long after we hit the highway in Vermont, we started noticing a steep decline in speed every time we started up a hill. Since Vermont is nothing but hills/mountains, this quickly became a major problem! At first, I thought it was because we were loaded to the brim and overwieght. Every available inch of space had something in it, so I sat quietly in my seat calculating how long it would take to get to Florida, 1300 miles, at 30mph. After a while, we were climbing hills at 18mph and getting up to 30mph on the downhill side of the hills. Not good! Finally, five hours later, somewhere in the southern part of Connecticut, Steve pulled off on the side of Interstate 95 and changed the fuel filters. It made me glad to have mechanic for a husband, I wouldn’t have thought of it! Problem solved! Woohoo – 65mph. Since it was getting late, we pulled into a rest area and got a couple hours sleep. Our first full day on the road started early. With the fuel issue solved, I had high hopes of making good time the rest of the trip….not so fast…literally! Not that again!! Nope, new problem. Ugh. Now, Waldo was overheating. We had had this problem before, but we thought it was fixed. Obviously not. We babied Waldo as best we could and finally made it to the outskirts of Roanoke, VA. I have a cool app on my phone called Overnight RV Parking It uses your location to show where verified free overnight parking is available. Or you can search an area using the map. I found a place we could stop for the night and give Waldo a break. Right off the highway was a Gander Mountain that allowed parking. We settled in for the night. There was another family parked near by. They had a dog too! Diesel got to spend some off-leash time playing ball after the store closed. Happy dogs! We’d been pretty lucky with the weather, once out of New England, we were out of the rain. The temps were rising and a cold one was just what I wanted. Knowing we wouldn’t make it to my dad’s house without stopping again, I began to look for a place to spend the night. I figured how many miles I thought we could make and chose A Big Wheel RV Park in Saint Mary’s, Georgia. A small, quiet park sounded like the perfect place to spend the night. Lucky for us, this is the off season and they had a pull-thru site available. We used our Passport America membership and our spot only cost us $19. In the midst of all of this, there was a family get together. For the first time ever, we had all three of our kids and all three of our grandchildren together. Finally it came down to packing Waldo. Our first destination is my dad’s house in Florida. There are just some things we don’t want to part with, but do not need on the road. Leaving them in Florida just makes the most sense, plus we need to have a new roof put on Waldo before we hit the road for good and staying at my dad’s sure beats nights in a motel! Finally, Waldo was loaded to the brim, every available inch of space was stuffed with something. It’s time!!! Happiness in the rear view mirror…. Florida – Here we come! By the time it stopped snowing, we had close to a foot of wet, heavy snow! And, for the icing on the cake – our snowblower crapped out and our plow driver broke down before he could plow our driveway! I promise, I am not making this up! We finally got the driveway cleared enough for them to get on their way and I’d be willing to bet, they won’t ever come back to New England quite so early. Yes, that is a weight bench and Yes I know I’m laying on it wrong! Maybe my next post can be full of the progress we are making! 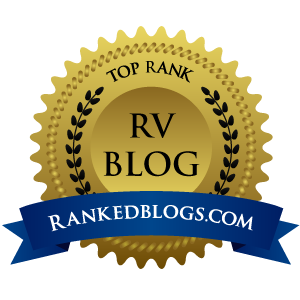 Author The Wandering RVerPosted on March 24, 2017 Categories Getting ReadyTags curtains, photography, privacy, RV Lifestyle, RV Living, sewing, shower curtains, Travel5 Comments on You can’t do that to me! I’m a SHOWER CURTAIN!! !